Are you a homemaker who is fed up with cleaning your tile flooring, but unable to redeem that shine it once had? If so, you are not alone. Today, homeowners have a variety of different types of floors they can choose from to give their home a majestic touch of elegance. While aesthetic appeal and functionality are two major factors for choosing a floor type, people also consider how easily it can be cleaned on a regular basis. In this respect, tiles are the most preferred option. Wondering why? According to Consumer Reports, while wooden floors do look better, they require frequent maintenance and are unsuitable for areas like the kitchen, porch, and bathroom. Not everyone has enough time to look after their wooden floor on a daily basis and spend money on hiring professionals to take care of it. Tiles, on the other hand, are durable, easy-to-install, waterproof, and available in a variety of materials and designs. However, if you want your tiles to look neat and tidy, it’s better to clean them regularly. Don’t know how to do it right? Here I have shared some tips on how to clean your tiles. Use a fluffy dust mop or a vacuum cleaner to remove all the dust and dirt from the tiles. Never use a straw broom, or you’ll start seeing scratches after a while. After cleaning with a damp mop, always dry the floor because the wet surface will cause airborne dirt to set instantly. Use a soft dry cloth for this purpose. Use absorbent cloths to wipe off any spill right away to avoid stains on the tiles. For spills like pet defecation or raw meat, you should use a strong cleaner. Remember, only spray the cleaner on the spilled area – too much of it can fade the color of your tiles. Place a doormat on both sides of your entrance to avoid any dirt or mud in your home. This step is especially advised during the rainy season. It might sound odd, but if detergents can clean your dishes removing sturdy stains, why not try them on your floor? The mixture of water and dish detergent can be used to mop your tiles and remove all the greasy stains. Spread the mixture on the stain that you want to remove. Let it sit for approx. 5-10 minutes. Then, scrub the area with a soft brush, and rinse the tiles with warm water and clean it with a cloth. You can repeat the process until the stain is completely gone. The vinegar will work impeccably as a grease remover. The acidity it creates will help you in removing the toughest of stains from your tiles. It’s a great solution for cleaning kitchen tiles. You can always go to the market and grab any tile cleaner from the shelves. Use them in the same way as mixtures, and they will do a good job. However, I advise using homemade mixtures to avoid chemical solutions, which might damage the tiles in the long run. Cleaning tile grout is also crucial, as it will make your tiles look as good as new. Tile grouts can absorb grease and other stains over time. You can use a mixture of baking soda and water to clean the stains. Apply the mixture and let it sit overnight. Use a stiff nylon brush to scrub the mixture off – that should do the trick! You can see the difference yourself. I hope you found these tips and steps about how to properly clean your tiles useful. 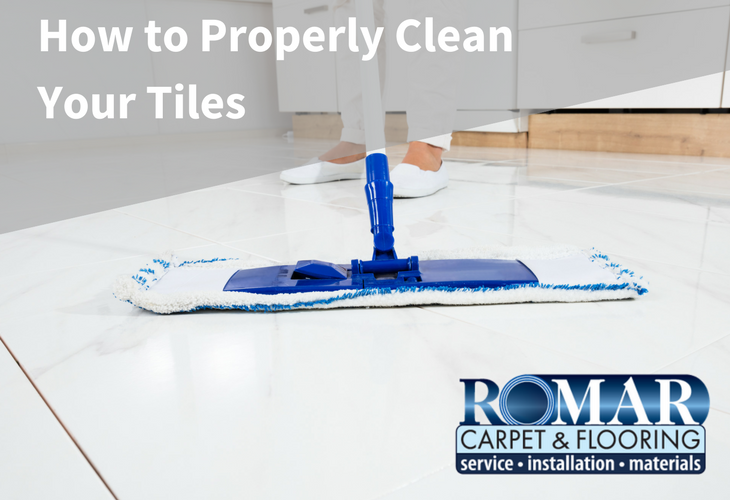 It’s better to be careful and clean your tiles to prevent them from getting damaged. It's not cheap to get tiles re-installed, so keep them neat and tidy. Did you find this tutorial helpful? Let others know about the best way for tiles cleaning by sharing this tutorial. Do you have other tips and tricks to add? Share your thoughts with us in the comments.